Remember - we are a volunteer-based, non-profit organization. We can not run this organization for the 300 children in our program without the help and support of everyone through our volunteer credit hour process. Each family is obligated to complete their required volunteer credit hours unless you bought-out during registration. You can use the "Volunteer Sign-ups" tool to sign-up for a volunteer slot as they become available and are posted. To make your job selection easier - be sure to use the Filter Opportunity option under the "Options" drop down in the upper left hand corner to find the postions you are looking for. 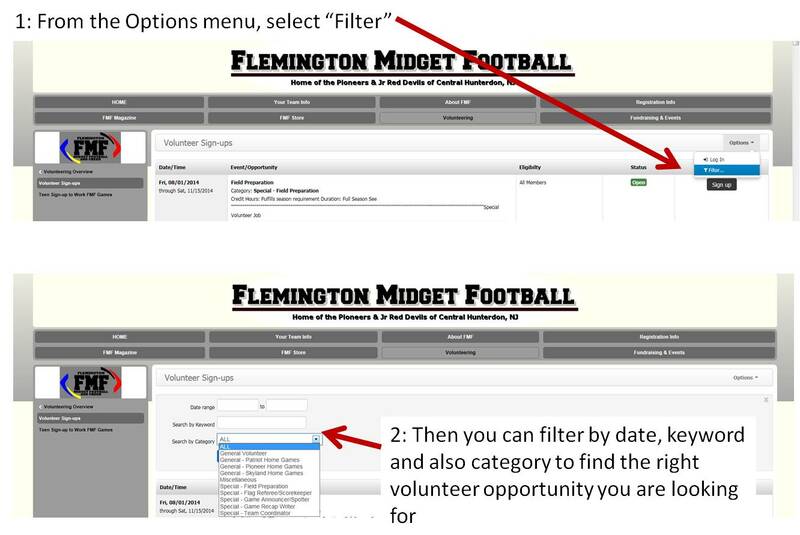 You can filter by date, by category or by key work like "50/50"
These will be one-off volunteer opportinities that pop-up from time to time based on the needs of the organization. Families have the option to buy-out of their volunteer credit hour commitment at the time of their registration. The money goes toward hiring students to fill the required volunteer job. Just because you buy out, doesn't mean the need for workers goes away. You can use the "Volunteer Sign-up" tool to sign-up for a volunteer slot as they become available and are posted.